US imports are probably thought of as mass produced products aimed at giving value for money, but in some cases the finishing and fitting out are lacking. 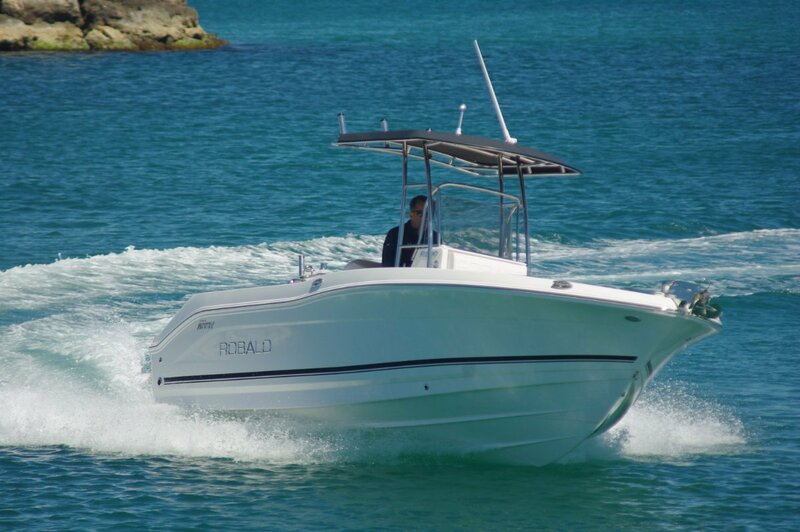 The review boat, a Robalo R20, is not one of these. Robalos are in hand laid glass, Kevlar reinforced, and the hand work shows. Wherever non-moulded surfaces appear they are almost as well finished as the gel coated exterior. There is not the smallest piece of timber in the structure; this is a guaranteed rot-free boat. Look at some of the cheaper boats dating from the 70s and you might see a bulging transom whose timber core (I once saw a chipboard version) had soaked up ocean. Or you might see a non-marine ply deck giving up the ghost. Robalo has enough faith in its product to give it a 10-year hull warranty. The R20 is big enough and well laid out enough to qualify as an all-rounder: access to plenty of the boat’s perimeter for fishermen, lounging space for less active days. The console is substantial without appearing oversize. By some conjuring trick Robalo made it roomy enough to house a toilet capable of being used. Or housing vast amounts of gear (it is lockable), depending on priorities. Its door is a neat arrangement that carries a seat. The console’s rear naturally has plenty of area for electronics and the buyer of this boat specified at the high end. Two other features are not common. The stainless wheel has a knob allowing you to get full use of it one-handed. Perhaps even more thoughtful is behind a small door low down: the battery switches. No groping needed in the transom. The bolster seat is mounted on the best esky frame I have seen. A king size esky is secure there but able to be removed with the minimum of fuss. This area is shaded by a magnificent T-top: tricky fabric as taut as a hardtop stretched over a faultless stainless frame that defines heavy duty. This was made locally and there is sense to this: Sandgropers are possibly the world’s greatest lovers of sea going shade. In non-fishing day mode there are space and seats for something like 10 adults. The V-shaped forward settees are, of course, equipped with lockers underneath which, unusually, are lined. 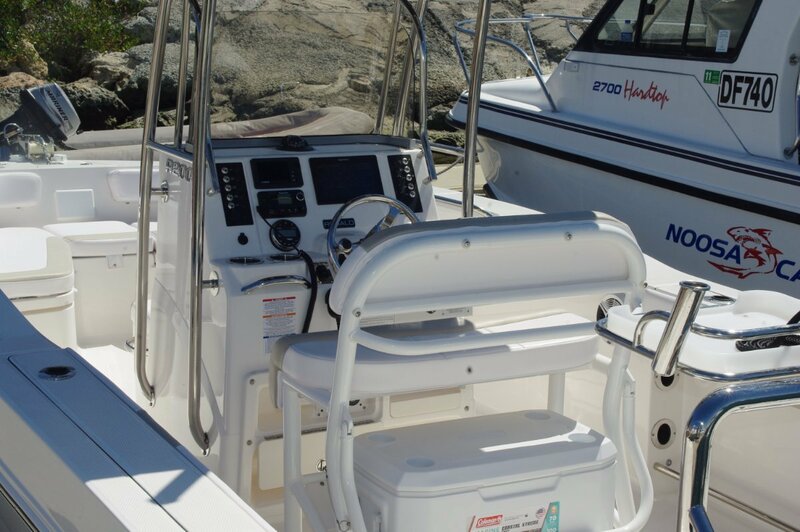 The quarter seats fold flat to become steps through the transom doors to the swim platform. Lifting the seat cushions opens up more storage. Below these are the deck drains – yes, this is a self-draining deck – that look big enough to quickly cope with any quantity of water likely to come on board. Despite the raised deck, the sides are high enough to give a secure feeling to anyone leaning against them. The long side pockets are also lined, and are capable of rod stowage. If you feel the need for more capacity, the Targa frame has a battery of rocket launchers, the removable bait board has more, and the sids more again. Illustrating the mixed use the builders see for the Robalo the bait board’s construction incorporates a ski post. The R20 is a more than competent fishing boat in standard form. A stable platform, it further cossets its occupants with padded coamings. There is a standard salt water deck wash, and a plumbed and lit live bait tank. The R20 can take motors up to 200hp. 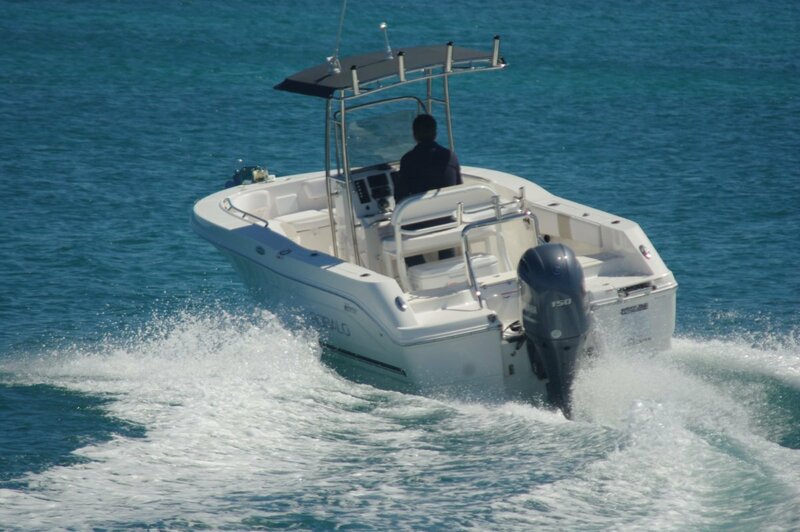 Our 150hp Yamaha was a useful percentage of that and showed itself to be no slouch with a top speed of 37 knots. Speeds like that are, of course academic, but the ability to make them has advantages at lower speeds. It was a light weight sort of a day that allowed us to play hard with a boat that encouraged just that; great fun and highly manoeuvrable. It makes no claim to be a sports boat or a heavy weather boat, but the hull suggests otherwise: 18 degrees of deadrise and a purposeful shape. The right sort of boat to be in coming back from Rottnest in a screaming sea breeze.